Archer-Daniels-Midland Company (ADM) manufactures and sells protein meal, vegetable oil, corn sweeteners, flour, biodiesel, ethanol, and other value-added food and feed ingredients. This dividend champion has paid dividends since 1927, and has increased them for 37 years in a row. The company’s last dividend increase was in February 2013 when the Board of Directors approved an 8.60% increase in the quarterly distribution to 19 cents /share. The company’s peer group includes Bunge (BG), Ingredion (INGR) and Cargill. The company has managed to deliver an 11.30% average increase in annual EPS since 2003. Analysts expect Archer-Daniels-Midland to earn $2.55 per share in 2013 and $2.95 per share in 2014. 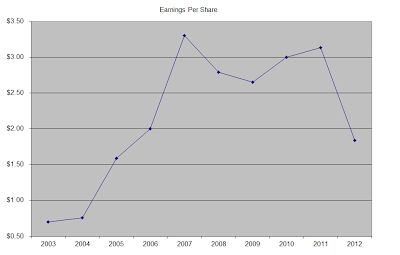 In comparison, the company earned $1.84/share in 2012. Over the next five years, analysts expect EPS to rise by 10%/annum. One of the driving forces behind future growth could be the company’s potential for expansion in its Agricultural Services and Oilseeds businesses. The firm plans on allocating 80% of its capital spending budget to these two segments. In addition, it plans on spending half of its growth capex on international operations. ADM is in the process of bidding for Australia’s GrainCorp, which could potentially provide it with higher presence in Asia. In the long-run, strong demand for crops and agricultural products globally should be beneficial for Archer Daniels Midland. This is a function of potential for the gradual increase in the global population. The world population is expected to increase by 1.4 billion people through 2030, which represents an increase of over 20%. The highest population growth would be experienced in Asia and Africa. While the company has a strong dominant position in the industry, it is exposed to volatile commodities prices. The Oilseeds Processing segment includes activities related to the origination, merchandising, crushing and further processing of oilseeds such as soybeans, cottonseed, sunflower seeds, canola, peanuts, flaxseed and palm into vegetable oils and protein meals for food, feed, energy and other industrial products industries. Oilseeds and oilseed products may be processed by ADM or resold into the marketplace as raw materials for other processing. This segment accounted for 45% of ADM’s 2012 operating profits. The Corn Processing segment includes corn wet milling and dry milling activities, primarily in the United States, to produce ingredients used in the food and beverage industry including syrup, starch, glucose, dextrose and sweeteners. Dextrose is also used by the company as a feedstock for its bioproducts operations, including the production of ethanol, amino acids and industrial products. Corn gluten feed and meal, as well as distillers grains, are produced for use as animal feed ingredients. Corn germ, a by-product of the wet milling process, is further processed as an oilseed into vegetable oil and protein meal. 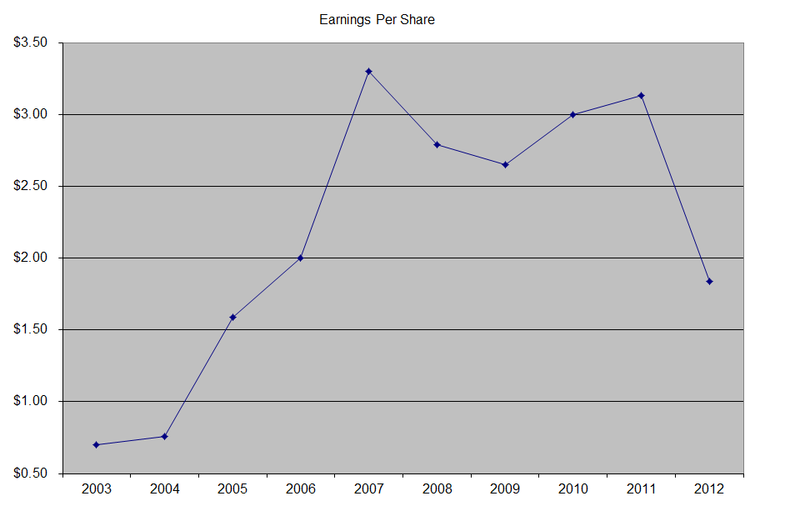 This segment accounted for 21% of ADM’s 2012 operating profits. The Agricultural Services segment utilizes the company's extensive grain elevator and transportation network to buy, store, clean and transport agricultural commodities, including oilseeds, corn, wheat, milo, oats, rice and barley; and resells these commodities primarily as food and feed ingredients, and as raw materials, for the agricultural processing industry. Agricultural Services' grain sourcing and transportation network provides reliable and efficient services to the company's agricultural processing operations. The Agricultural Services segment includes 160 domestic and 25 international elevators, an animal feed facility in Illinois, 27 domestic and seven international formula feed and animal health nutrition plants, an edible bean plant in North Dakota, 23 domestic edible bean procurement facilities and a rice mill in California. This segment accounted for 33% of ADM’s 2012 operating profits. The return on equity for Archer-Daniels-Midland has been following the rise and fall in commodities prices over the past decade. I expect this indicator to increase over the next five years, as earnings per share rebound. Currently, the cost of capital is 5.30%, which bodes well for the earnings growth potential behind new projects and capex spending. I generally want to see at least a stable return on equity over time. I use this indicator to assess whether management is able to put extra capital to work at sufficient returns. 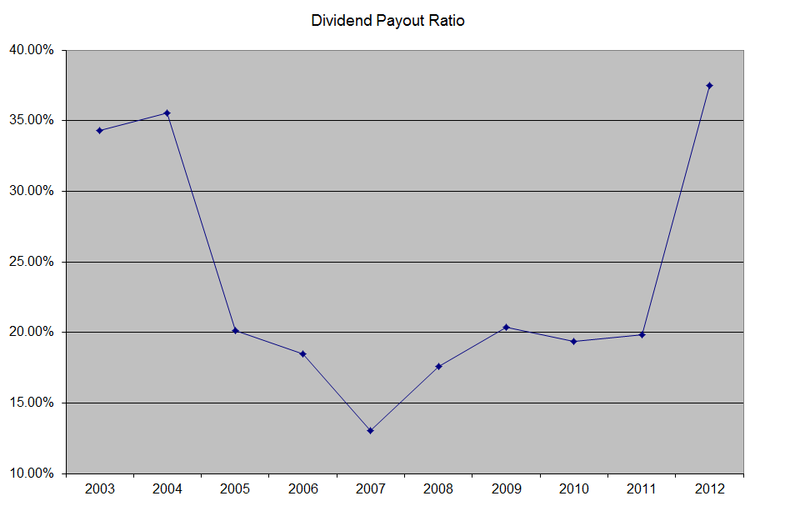 The annual dividend payment has increased by 12.30% per year over the past decade, which is slightly higher than the growth in EPS. 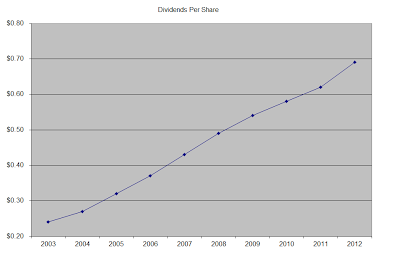 A 12% growth in distributions translates into the dividend payment doubling almost every six years on average. If we look at historical data, going as far back as 1990, one would notice that the company has managed to double distributions every six years on average. 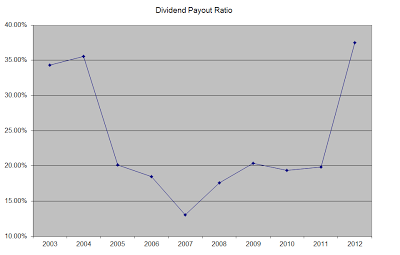 The dividend payout ratio has charted a complete u-turn over the past decade. However, it has never gone significantly beyond 35%. A lower payout is always a plus, since it leaves room for consistent dividend growth minimizing the impact of short-term fluctuations in earnings. Currently Archer-Daniels-Midland is attractively valued at 17.30 times earnings, yields 2.30% and has a sustainable distribution. I would consider adding to my position in the stock on dips below $30.